Oreos have been expanding into all kinds of different and creative flavors. When I was at "the" Walmart (since there's only one here on Maui it gets a title.....just like Costco is the Costco), I saw Lemon Oreos. It reminded me of the Girl Scout lemon creme cookies - and those are hard to find. Naturally, I added them to my cart. And then I had to have a plan. Because eating Oreos out of the package is not a plan (at least to me....but it could be). Know what else is a premium on Maui? Lemon cake mix. I found one box and it was not on sale. But the end result were delicious lemon cake bars, so I was happy. And so were my friends. Preheat your oven to 350. Line a 13x9 pan with foil coated with cooking spray, or spray your pan directly. In a large mixing bowl combine the cake mix, margarine, and egg until mixed into a dough. Add oreo pieces and incorporate into the batter. Press the dough into the bottom of the 13x9 pan. In a small mixing bowl, combine the can of sweetened condensed milk and lemon juice and stir until smooth. Pour over the dough in the pan. Bake for 23-27 minutes. Allow to cool and then cut into bars. 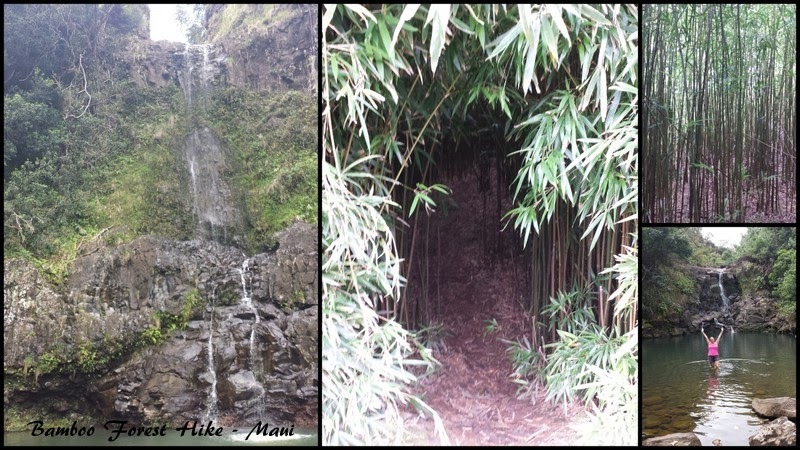 Last weekend, I went on the Bamboo Forest hike. Gotta love hiking waterfalls!